“Fight the seven signs of aging” I can hear the commercial in my head right now! Aging… that’s a hard truth to swallow… why oh why can’t I pretend my skin is still 20 years old??! I’ve always known the importance of taking care of your body’s largest organ. Drink plenty of water, never wear your makeup to bed, wash your face, don’t smoke, be gentle around your eyes, eat healthy and wear a good moisturizer (don’t forget your neck too) were all things drilled into my head from before my first zit popped. She is 70! You heard me right, SEVENTY. Why does she look decades younger?? She takes care of her skin, always has and always will. What she puts into her body is also as important to her as what she puts on her body. She can also out-run me any day… heck who am I kidding, she can out-walk me!! At the end of November of last year, I was invited to become a Proctor & Gamble ambassador (#PGMom) and in exchange they’d send me free product to try out and if I liked it, to talk about here on Shasher’s Life. A couple of weeks ago I was sitting having coffee with a girlfriend when she commented on my skin. She’s known me for 15 years and has seen me at my best of times and at my worst. She noted that my skin had a great glow to it. My daughter has recently commented that my “bags” don’t look as dark as before. Only my daughter knew I’d started to use a new skincare product. I’m giving away the same bundle that I’ve been using and will continue to use from now on. You can enter to win via the Rafflecopter at the bottom of this post. My absolute favourite product in the line is the Olay Total Effects Daily Anti-Aging UV Moisturizer Plus Touch of Foundation Cream. It’s like putting on whipped, creamy — I want to say butter but it’s not greasy — my skin loves it! Olay Total Effects Daily Anti-Aging UV Moisturizer Plus Touch of Foundation Cream provides seven anti-aging benefits including line appearance minimization, nourishing moisturization, subtle appearance firming, brightening, gentle exfoliation, pore appearance refinement and anti-oxidents. It helps renew, restore and protect from UV rays for aging skin with the added benefit of a sheer foundation for immediate tone improvement. Olay Total Effects Refreshing Citrus Scrub offers an invigorating scrub that cleanses your skin without over-drying. Formulated with oil-absorbing beads, it gently exfoliates and cleanses throuoghly while the citrus-kissed formula refreshed your skin. Olay Total Effects Tone Correcting Eye Treatment treats the sensitive and delicate skin under the eye that needs to be treated with TLC. This treatment diminishes the look of under-eye darkness and helps to fight the seven signs of aging. Enter to win the above mentioned Olay Total Effects skincare bundle, valued at approx $140! This contest is open to Canadian residents only, you may enter on a multiplicity of #PGMom blogs but can only win once. I cleanse and moisturize everyday and get a facial once a month. I started using a moisturizer this year and I try to drink more water. Not doing much and should be! Package would be a great start. I just started using an eye cream because I was noticing more and more dark circles. 🙁 I also have found exfoliating to be HUGE for keeping my makeup looking fresh throughout the day. I make sure I m put on moisturiser every morning and night. I try to drinks lots of water, wear sunscreen and moisturize twice morning and night. I started using a night cream. I'm starting to do glycolic acid peels. Not burning the candle at both ends any more and industrial stretch spackle (aka. foundation). I used to not care at all.. I'd go to bed with my makeup still on and never, ever moisturized. I now make sure I cleanse, tone, and moisturize morning and night! I spend more time on my eyes to reduce lines and wrinkles. I'm using less soap and more water! I also use sunscreen. Adding a serum to the mix. Sunscreen. I've been changing more and more of my products to anti-aging or tightening products. I moisturize day and night and try to drink plenty of water. I'm using moisturizer more often and trying to drink more water. I haven't made any changes, I just try to wash my face daily. Im trying to drink a lot more water and make sure I remove my make-up every night no slip ups and I moisturize,moisturize & moisturize. i cleanse my face every day and moisturize as well, i am a little slacking on the other areas besides mositurizing and cleansing oh and sunscreen! cleanse, moistureize, sunscreen when needed! Using sunscreen and finding a moisturizer that has SPF in it. More SPF lotions/creams are used. Pay more attention to using sunscreen and wearing long sleeves. I am adding more anti wrinkle stuff to my routine. I am trying to make an effort to use night cream. Other than that, I am in denial! I'm using moisturizer more often. trying to get into a routine of using moisturizer and sunscreen ! This would be such a great prize ! Thank you for the opportunity ! I would like to say that I am doing something but I'm not but I know I should be taking better care of my skin. Would be nice to win this prize and start. Thanks for the giveaway! I use a lot of creams and moistuizers with spf in them and have always used olay at night. Interested in giving Olay a try. I have to watch since I have sensitive skin. Thanks for the chance. I use noisterizer with SPF every day. I'm exercising more. I've heard it's one of the very best ways to stay youthful. Im drinking more water with lemon as well since it is winter I have bought a Humidifier and changed my sheets that have a silk blend (Cotton Sheets absorb moisture and natural oil from your skin). I have also been eating a lot of avacado as well as apply a mixture of honey and avacado on my face 3 times a week and putting on a deep night time cream that has the added Rose water to it. As well, cucumber with celery blended with the added green tea (mix all in a blender is THE best for your skin) It has made my skin SOOOO NICE, smooth, no dryness, it seems brighter, clear, soft to the touch..I drink that (make it) twice a week!!! I would love to win these products to add to my routine! Thank you SO much!! I am putting moisturising cream more often on my face, arms, hands and feet. I have introduced serums along with my moisturizers! Eye cream with spf is a must! I'm starting to moisturize more often! I moisturize more often as I get older! I don't have a skin care routine or anything, but I try not to stay out in the sun like I used to, esp. w/out sunscreen. I use moisturizer more as I'm aging!!!! Moisturizer is a big part of my regimen! I have not found a good anti aging cream and I need one in an extreme way. Please could I try out your product.. if it really works I will continue on and buy the product to use forever. I would love to try this and I'm almost out of moisturizer so this would be perfect! I try to stay out of direct sun as much as possible. Since the aging process now shows on my skin, especially around my eyes, I moisturize constantly. I moisturize before putting on my makeup and when I get home I remove my makeup and moisturize again and then before bed I use a night cream moisturizer. I have noticed more fine lines around my eyes and I hate them. I make sure that I pay special attention to my eye area and always have it moisturized. Thank you for this very nice giveaway. As I age I always make sure I moisturize my skin. Especially after my evening face wash before bed. I remove my make up every night. I wash my face morning and night and apply moisturizer. I moisturize with SPF now. I have rosacea so I always have that rosey glow but the medicated cream is really drying my skin out. I'm creeping up on 40 so I'm starting to notice all those little lines that weren't there a couple of years ago so I guess I can't deny it any longer. I need an eye cream. I actually use a tinted Olay moisturizer and it makes my skin very soft and adds a nice sheen to it! I moisturize after removing my make up each nite and before applying make up – I think I could use more of a routine – I am nearly 60. Would love an astringent and an eye cream. Would love to win! i drink lot of water an moisturize every day. I've been using olay products for a very long time. but right now I tried coq10 supplements. they said it's good for anti aging. I hope it works well with me because olay is expensive. 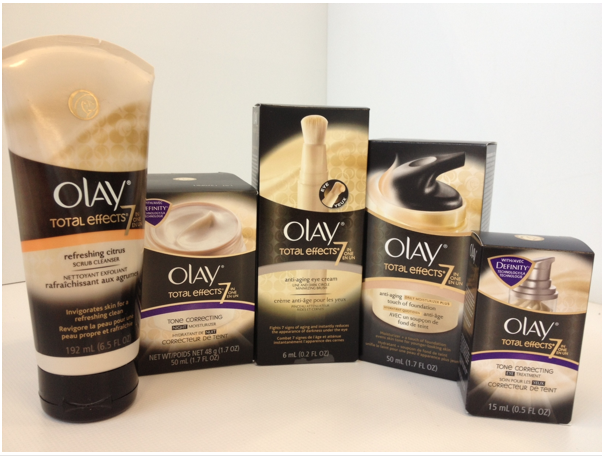 It Would Be Great To Win The Olay Total Effects Skincare Bundle. What changes are you making to your skin care routine as you age? I Am Using Sunscreen And Moisturizer. I try to put night cream on my face and hands to help keep my skin soft and smooth and drink plenty of water to keep my body and skin hydrated.